The end of the XIX century was marked by the constant confrontation of various political groups, which could not eventually touch the art and, as a result, led to a crisis in it. However, some of the painters in this difficult situation also found the beautiful in man and his environment. That was Petrov-Vodkin. The development of the artist was quite difficult, he tried many different techniques in writing his paintings, until he came to his personal style, so known to us today. To say that the work of Petrov-Vodkin was clearly accepted by connoisseurs of painting, it is impossible. There is still a serious controversy around his canvases. Benoit, for example, responded laudably and even admired some of the individual works of the artist. Repin, on the contrary, spoke out harshly, insultingly, considering the paintings of the author under discussion as daubs. 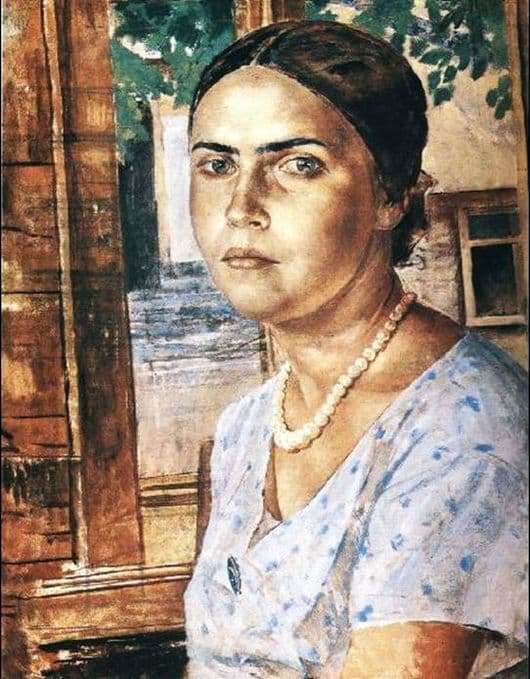 In the portrait with the image of a close-up of the girl “At the Window”, Petrov-Vodkin represents a combined, inspired image, while the viewer does not see this image as artificial. The girl in the artist’s picture is not just a face, but a deep psychological image. Petrov-Vodkin applies a realistic style of composition, but refuses to move the light, which is so widely used in the paintings of other authors. Color plays a side role in character transfer. Primary – given by the artist, the incident light. The muffled tones used in this piece convey peace and bliss precisely. Petrov-Vodkin does not just paint pictures, he deeply philosophizes on the subject of the human soul and interpersonal relationships. After death, the artist was forgotten for a long time, but today art still accepted him as a master of great proportions. According to Yu. Rusakov, such people are able to move art.